The first map of ancient Jerusalem from the Bible would depict the meeting of Abram and the mysterious Melchizedek. The is the first mention of Jerusalem in the Bible, though not by that name. Genesis 14:18-20 depicts this interesting encounter which is said to have taken place in Salem. 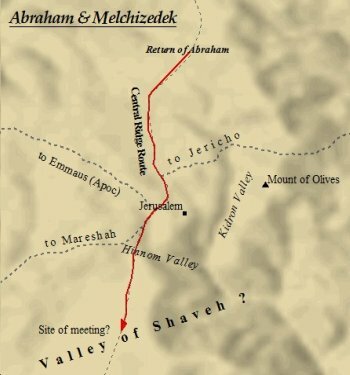 THE VALLEY OF SHAVEH is the first landmark mentioned from a map of ancient Jerusalem. However, this valley's exact location remains a mystery, as does the identity of Melchizedek, the king of Salem at this time. 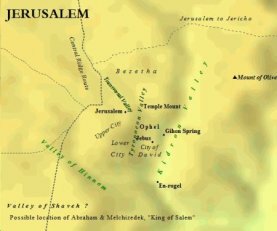 From the map of ancient Jerusalem to the left one can gather that Jerusalem was a city of hills and valleys, in many ways like ancient Rome. This mysterious encounter predates the Jebusite occupation by approximately one-thousand years. Dates vary as to the time of Abraham, but it is generally believed to have been between 2000 - 1700 B.C.It is likely, however, that the site was nearby, if not on the same spot. The reason being is the Gihon Spring, a natural water source and one of the few in the Central Highlands. Ancient occupation tended to spring up near these natural water springs and wells. Jericho is another example of such a city, and was only around 13 miles east of Jerusalem. Click on a link below to view that section. The first mention of Urusalim can be traced to Egyptian Execration Texts. The Early Execration Texts ( 12th Dynasty, ca 2000 BC) date to the late 20th and 19th centuries B.C. Two sets of texts exist, with the Later Execration Texts dating to the late 19th century B.C. 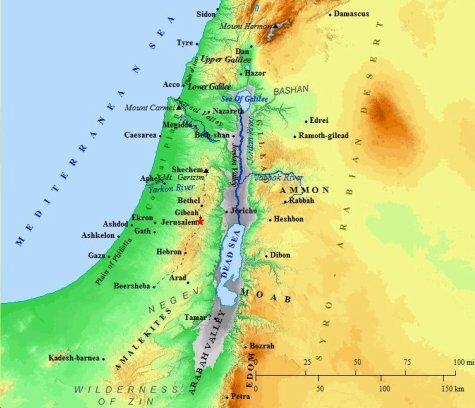 In the earlier texts only a few cities are mentioned in this region of Canaan. Jerusalem, Ashkelon and Rehobin are the chief ones in Palestine. In the later texts, the two principal cities of the region are Shechem and Jerusalem. Jerusalem is called Rusalimum in some of these references. Indeed this is proof that the cities in the patriarchal narrative were in fact occupied and in existence during the Middle Bronze Age (ca 2000-1550 BC), and perhaps parts of the Early Bronze Age (ca 3300-2400 BC). 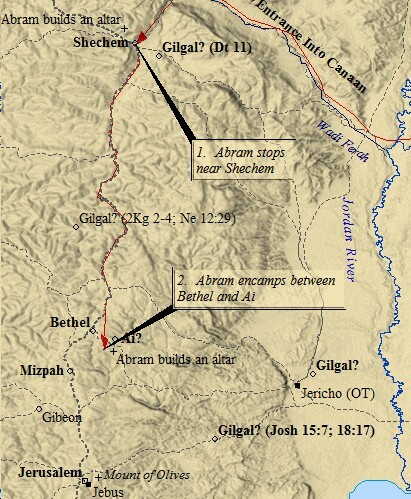 Abraham entered Canaan via the Wadi Farah. As he reached the Central Ridge from the valley below, Shechem would have been the first city he encountered in the Central Highlands. The city of God was radically shaped by it's geography. Jerusalem sat atop the central ridge of the Western Mountains. The mountains around God's city were known as the Central Mountains, or Highlands. In the immediate area were the Judean Mountains. The Central Ridge Route ran through Jerusalem, and connected in with Shechem to the north, and Beersheba to the south. Ancient Jerusalem was literally shaped by these mountains and valleys. The city was protected by steep ravines in the south and east. To the east the terrain drastically plummeted nearly 3,500 feet from the Mount of Olives to Jericho below, in the Jordan Valley. In the west the change was less drastic, as the hills descended to the coastal plain and the Mediterranean Sea. 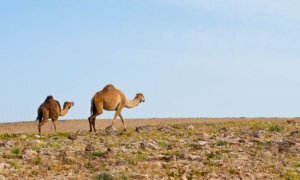 Abraham not only dwelt in the Central Highlands, but primarily in the Negev, the desert region in the south. To the immediate southeast of Jerusalem was the Judean Wilderness, which merged with the Negev south of Hebron. It was in this vast wilderness Jesus was tempted by the Devil. 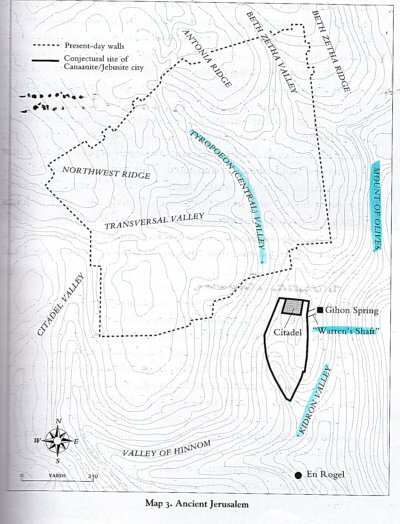 Courtesy of Eric H. Cline's book, Jerusalem Besieged, indicates the topography of early Jerusalem as well as the location of the Gihon Spring. The citadel is that which David conquered from the Jebusites in ca 1004 BC. The first Biblical mention of "Jerusalem" is in Joshua 10:1. The city is under the control of king Adoni-zedek. At the time of the conquest Jerusalem was an Amorite town. It, along with Hebron, Lachish, Jarmuth and Eglon all formed an alliance against the invading Israelites. The Jebusites were of Amorite stock intermingled with Hittite blood. Their stronghold was located on the southern portion of the eastern ridge, lined by the Hinnom valley in the south and the kidron valley to the east. The Tyropoeon Valley separated the eastern and western ridges from each other. ANCIENT JERUSALEM was originally allotted to the tribe of Benjamin, though Judah would eventually absorb her. 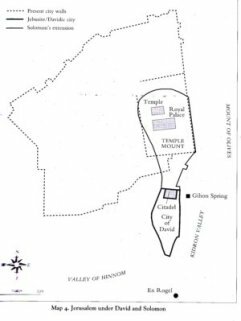 This map of ancient Jerusalem depicts the boundary between the two tribes. However, it would not be until the time of David that the city fell into Israelite control. The Bible tells us that men of Judah and Benjamin co-existed with Jebusites in the hills and valleys surrounding the primary stronghold. Jebus, the hill of Ophel and the Temple Mount all rested on the eastern ridge. This was a plateaued ridge, with the northern end elevated above the southern end. The southern end was occupied by the citadel, with fortified walls that extended down the southern slops towards the valley of Hinnom. The Temple Mount sat elevated above the City of David in a beautifully symbolic representation of God's sovereignty over His people. JERUSALEM formed on the eastern and western ridges. After David established Jerusalem as Israel's capital, the city steadily grew. Solomon turned it into the religious center of life as well with his Temple to God. Jerusalem was the center of Israelite existence, as it is today. 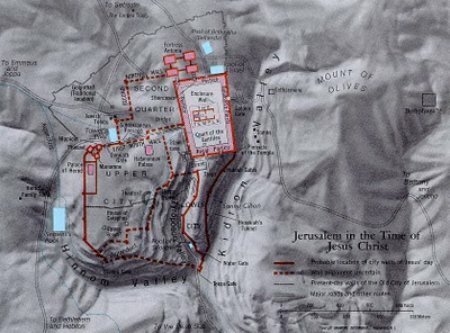 This map of ancient Jerusalem shows the growth from the original site. The Tyropoeon Valley separated the eastern and western ridge. 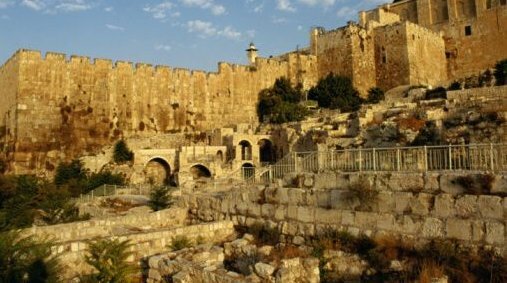 It was on the lower slopes of the western ridge that the Lower City of 1st century AD Jerusalem took form. 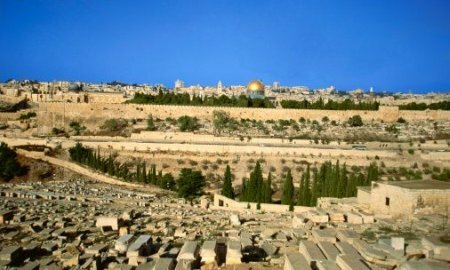 The ridge flattened out at the top, where the Upper City took shape, housing Jerusalem's royalty, elite, wealthy, and priestly class. As the city continued to expand, suburbs formed, primarily in Bezetha in the north. Titus marched his army through these suburbs in the Roman siege and destruction of Jerusalem in 70 AD. MAP OF ANCIENT JERUSALEM under kings David and Solomon depict the city much the same as it was under Jebusite occupation. 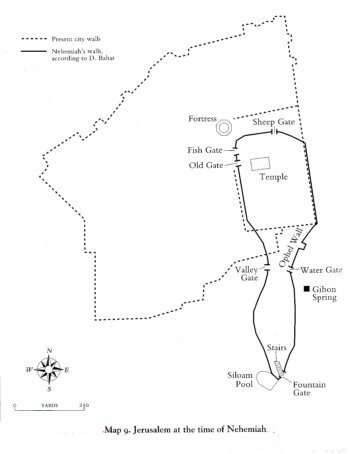 One of David's men, Joab, discovered a way into the city via the water tunnel from the Gihon Spring. He threw open the city gates to the awaiting Hebrew warriors. David took the city around 1004 B.C. and built "all around from the Millo and inward". The conquest is recorded in II Samuel 5. David also built a palace in his new capital city. Solomon rebuilt the Millo, or citadel, during his reign, and also built the First Temple on Mt. Moriah. This was on the northern end of the ridge, and elevated above the city of David below. It is interesting to note that Solomon's mother, Bathsheba, was a Jebusite. Upon his conquest of the city, David did not execute, nor did he exile, the local population. Rather, he allowed them to remain in their city, of course under his authority. He even purchased Araunah the Jebusite's threshing floor from him, when he could have just as easily taken it by force. JERUSALEM DURING NEHEMIAH This map of ancient Jerusalem (Jerusalem Besieged, 72.) depicts the city during the time of Nehemiah. In 586 B.C. Nebuchadnezzar, ruler of the Babylonian Empire, laid siege to Jerusalem. He breached the walls, looted the city and Temple, and burnt both the Temple and the city itself to the ground. Jerusalem was laid waste. In 538 B.C. Cyrus the Great, king of the Persian Empire, the conquerors of the Babylonians, issued a decree declaring that all Jews were free to return to Jerusalem and rebuild their capital city. That very year, one of at least three migrations back to Jerusalem took place. In 445 B.C., Nehemiah, a Jewish Persian official, reinforced Ezra the scribe in Jerusalem. It only took 52 days for them to rebuild the walls, and though smaller than Solomon's Jerusalem, the city was once again occupied by Jews. THE OLD CITY was conquered by David from the Jebusites. This photograph shows the ruins from ancient Jerusalem. The foundation of a wall from these ruins dates back to ca 1800 B.C. Jerusalem has likely been occupied for over 4,000 years, and these ruins attest to the antiquity of Zion. 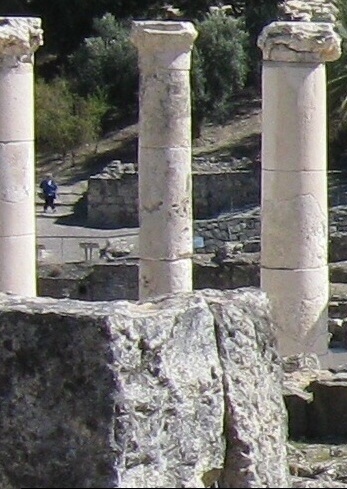 David captured the city, which would have included these ruins, around 1000 B.C. It is remarkable to think David's hands may have rested upon the stone pictured. 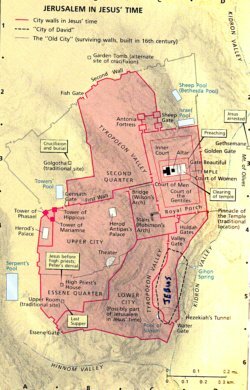 Any map of ancient Jerusalem is sure to include the City of David on the southern end of the eastern ridge. Above, on the northern end, was the Temple Mount. JERUSALEM DURING JESUS was a thriving metropolis, thanks in no small part to Herod the Great's eye and talent for architecture. The map of ancient Jerusalem above provides a detailed look at the terraced western ridge. The Tyropoeon Valley can clearly be seen dissecting the eastern and western ridges. The Lower City ascended the terraced western hillside to the Upper City above, home of the rich and famous. The Hinnom Valley runs along the southern border of both ridges, joining the Kidron. These ridges provided natural defenses for Jerusalem, and were also fortified by massive walls. 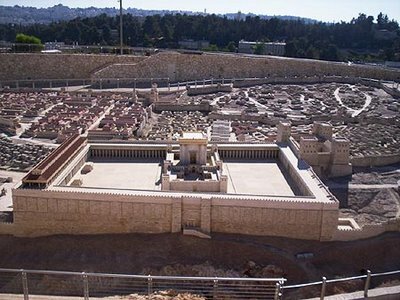 The Jerusalem Temple dominated the entire city, especially during the days of Jesus. MAP OF ANCIENT JERUSALEM This is a map from the Zondervan NIV Bible depicting first century Jerusalem. By this time ancient Jerusalem consisted of four main hills. 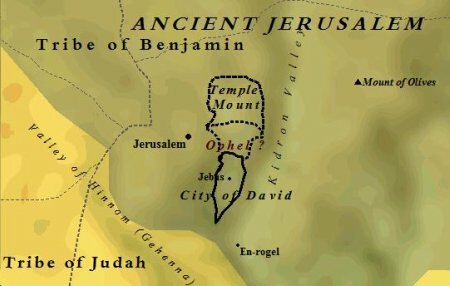 Ophel, the original site, in the southeast, and Mount Moriah, the Temple Mount, in the northeast, as depicted on this map of ancient Jerusalem. To the southwest was the Upper City, and the northeastern hill also on the western ridge was Bezetha, which comprised the suburbs of sprawling Jerusalem. Massive building projects characterized this time in the history of Jerusalem. The Antonia Fortress had been constructed, along with towers and palaces on a a grand scale. A Hippodrome and Stadium brought Greek style athletics to Jerusalem. Aqueducts transported water from as far away as Bethlehem. A Roman theatre and amphitheatre had been constructed by Herod the Great, catapulting Jerusalem into one of the great cities of this era. The grandest of all, however, was the Temple. Herod's Temple dominated the city. One block alone, at the southeast corner of the wall, weighed 90 tons alone. All that remains of it today are the Western Wall, or, the Wailing Wall. The Temple Mount dominates world attention, now occupied by the Dome of the Rock.